I’m always looking for the perfect snacking cookie during the holidays. Something without the dairy and sugar of typical cookies but with all the flavor I need to feel comforted. This is the one!! You won’t even notice that there is no butter or sugar. The sweetness comes from bananas and dates. The oats and nuts give it crunch and density. Say hello to bite size goodness you don’t have to feel guilty about eating. The perfect holiday cookie. Sugar free, gluten free and dairy free. A great cookie alternative. Line a cookie sheet with un-waxed parchment paper. Set aside. 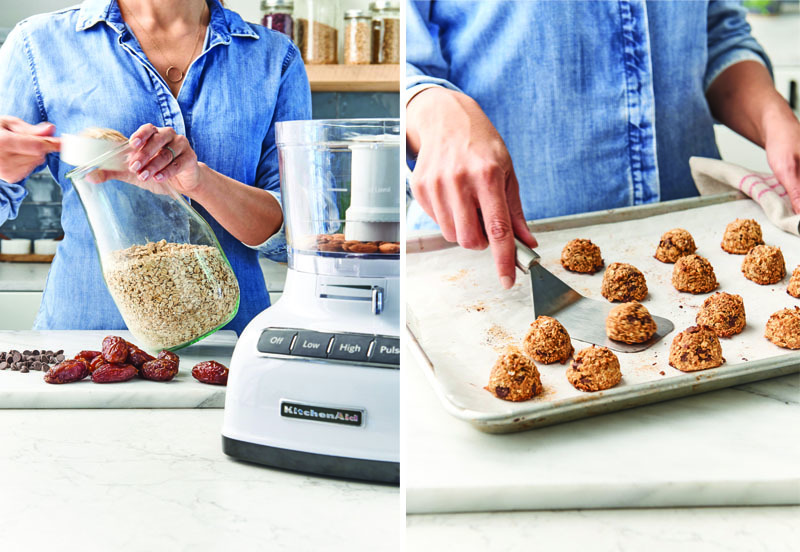 Put Almonds into food processor or high-power blender and process on High until they are ground to a meal-like consistency. Drain Dates; add to Almonds; pulse until combined. Add Banana and Almond/Peanut Butter. Pulse until combined, scraping down the sides as needed. Add the salt, and ¾ cup of the Oats. Pulse to combine. Transfer to mixing bowl, cover with plastic wrap and refrigerate for 15 minutes. 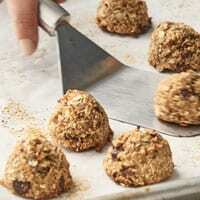 Remove from refrigerator and add Coconut, Chocolate Chips, and remaining ½ cup of Oats. Stir until combined. Using a 1-2 Tbls cookie scoop, or a tablespoon, make small rounds with the dough and place on parchment paper, about 1 inch apart. Bake for 15 minutes, or until the tops begin to brown. Remove from oven and let stand for a few minutes before consuming or transferring to a container. And for more healthy cookie options, here’s our Holiday Cookie roundup but don’t forget, moderation is the key to happiness!